The online version of BusinessWeek today features an interview with Jeff Goodby of Goodby, Silverstein & Partners, in which he refers to advertising as "design in motion," with the same responsibility to make itself welcome in the environment that physical objects have. As for the visual here, we figured it was more fun to look at than a picture of Goodby (no offense, Jeff). It’s from a site he mentions in the interview as one of his current favorites from the shop. 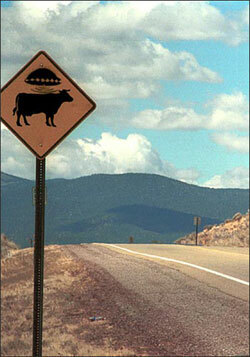 If you haven’t checked it out, it’s called cowabduction.com, and centers on claims that cows are being abducted by aliens. Yeah, it’s for the California Milk Processor Board. Goodby will be speaking tomorrow at a conference sponsored by the Art Center College of Design in Pasadena, Calif.